This is a good recipe for fasting people on navratri. It is similar to kachori, but made of wheat flour(atta). 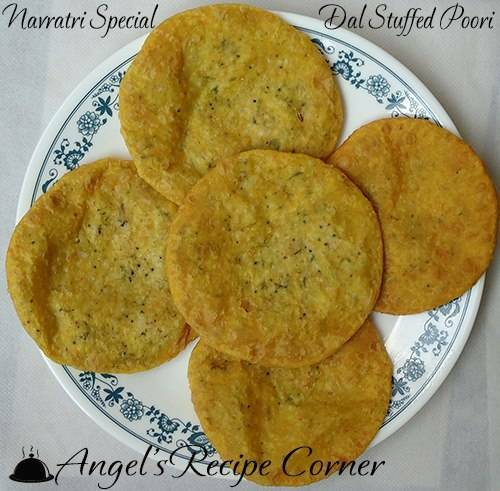 The filling used can be of urad dal or moong dal. Knead atta by mixing chilly powder, turmeric powder, jeera powder, salt and butter to form a soft firm dough. Keep it aside. Soak urid dal for 1 hour.Remove water completely and grind to a very course texture. In a pan, heat 2tsps of oil and add the mustard. When it flutters, add chopped items except corriander leaves and fry a little. Add the urid dal,chopped corriander leaves, garam masala, coconut scrapings and salt and fry for 5 more mts.The filling should be dry. Remove from flame. Make small balls out of the atta dough. Form puris from the balls. Place 2tsps of the filling on each puri and close it fully. Spread the closed puri to make it to a thick one and deep fry in oil, till well cooked. Fry the puris one by one.